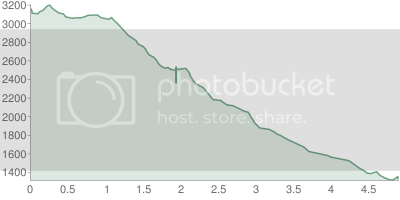 I have ridden many amazing downhills on the back of a mountain bike over the last 5 years. Since receiving a full-on downhill rig from Airborne, I thought that in order to find a descent long enough to truly enjoy it that I would have to travel back out West. I was thoroughly surprised to find a downhill run located east of the Mississippi that was ballsy enough, varied enough, and long enough to qualify as one of the best downhills of my life. Not only that,but it is located in Georgia. The Windy Gap trail located outside of Ellijay, Georgia is that trail. 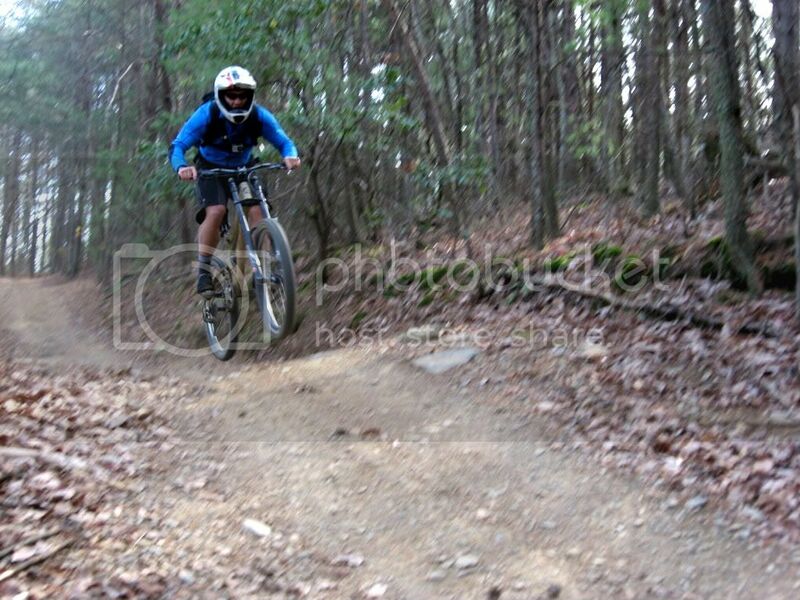 It is unlike any descent that I have ridden here in the Southeast. The properties that make it such an excellent downhill run are a direct result of the trail being primarily used by motorcycles. The first half of the trail dropping down off of Windy Gap is a continuous technical assault on your senses and bike's suspension. You will be bombarded by rock-after-boulder-after-rock: this trail is truly worthy of a dual-crown fork and a massive coil-over rear shock. While this trail was challenging, my rig helped me focus on speed instead of simply surviving. So while it was gnarly, Sugar Mountain is still way gnarlier: I felt like I was doing well there by making it down all in one piece! Be prepared to do a little bit of pushing through this upper section, as there are a few short climbs scattered throughout. But rest assured: it is well worth it! Windy Gap's second half could not be more different from its first! 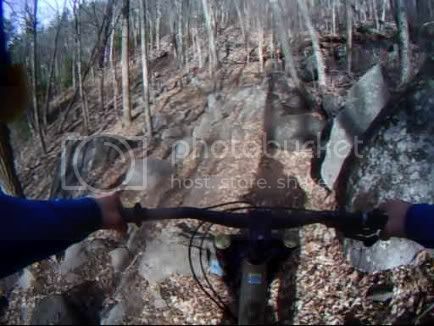 While the upper section was one massive bone-jarring rock garden, the lower section transitions into a smooth jump run all the way back down to the trailhead. 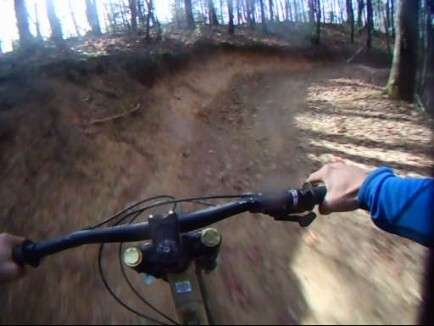 There were even some moto-made berms of about 8-10 feet in height that were perfect for railing at high speeds! 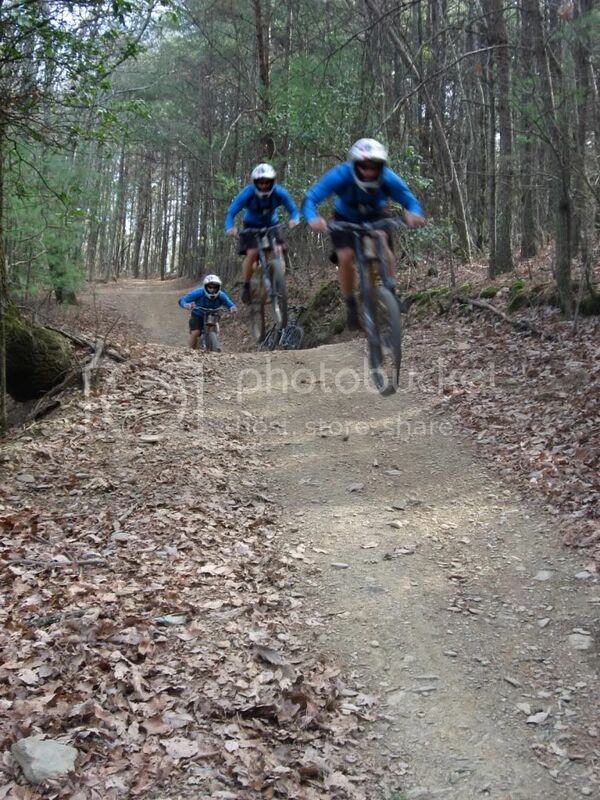 Bottom Line: Whoever said that there was no real downhilling in Georgia is just plain wrong. If you are willing to do a little bit of driving, Windy Gap is a very worthy descent! Windy Gap Part 2: Air from Greg Heil on Vimeo. We road this trail as a shuttle straight down from the top of the Windy Gap trail to the bottom of it, with no turn offs onto Tibbs or Milma. Read on for driving directions for shuttling. Download the Windy Gap GPS file here! Head west out of Ellijay on Hwy. 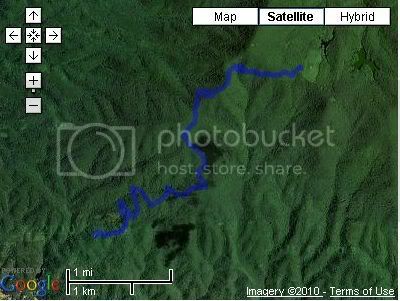 52.Go about 9.2 miles and take a right onto Mulberry Gap road/#18. There will be signs for lake Conasauga. If you reach the Cohutta Overlook you've gone too far. Turn around and take the first left. Drive along Mulberry Gap road a ways. 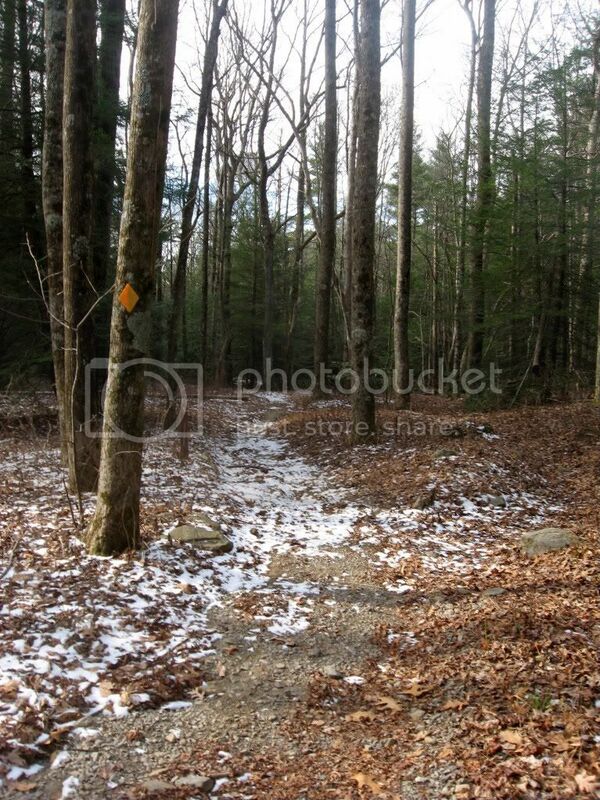 Take a left on Old CCC Camp Roadand keep going about another 6.3 miles. Continue about another mile or two once the road turns back to pavement. Make a right at the sign for the Windy Gap Cycle Trail, up the gravel road (#218). Drive up the road and park in the Windy Gap lot. Head north out of town on GA Hwy. 2 / 61 / US Hwy. 411. Go about 5.9 miles. Turn Right on Loughridge Road / CR 23. Turn Right on Crandall Ellijay Road / CR 21. 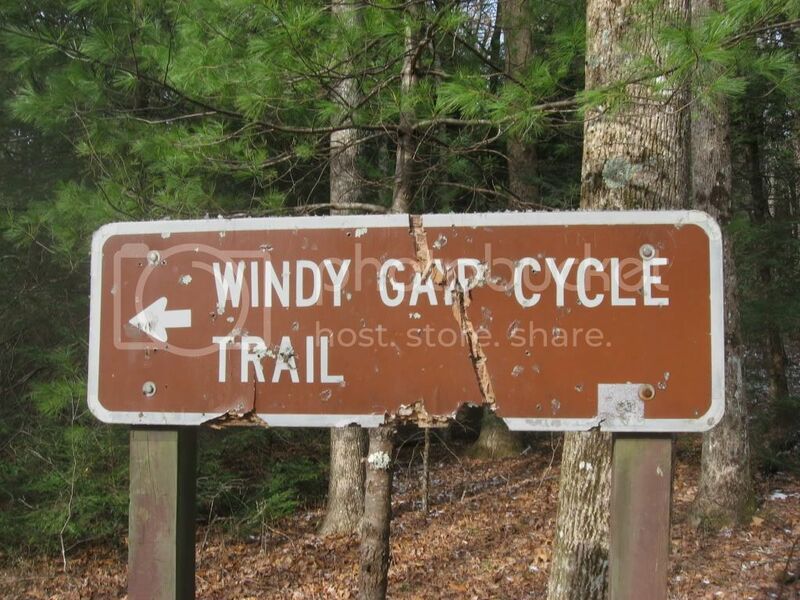 Make a left at the sign for the Windy Gap Cycle Trail, up the gravel road (#218). If you are going to shuttle this trail as we did, you now need to leave one car at the lower trailhead and take the other car all the way to the top of the Windy Gap trail. There is no direct way to get there. Despite the fact that the single/doubletrack trail is only 4 or 5 miles long, it is about a 45 minute drive from the bottom to the top, so be prepared to do some driving, especially when you come back to pick up the vehicle you left at the top. Head back down the gravel road that you drove up to reach the trailhead. Turn right at the pavement. Turn right onto Mill Creek Road and drive up it about 8.5 miles. Turn right at West Cow Pen Road and drive about 3.2 miles. Take a right on Conasauga Lake Road. Drive all the way to the end, going past the camping area and turn off near Lake Conasauga. Park near the top of the Windy Gap trail. Total distance: about 19 miles. Turn left at the pavement. Head back the way you came to the junction with Old CCC Camp Road and Mulberry Gap road. Bear left and continue up Old CCC Camp Road. Take a left to stay on Old CCC Camp Road. Take a left on Conasauga Lake Road. Drive all the way to the end, going past the camping area and turn off near Lake Conasauga. The National Geographic Trails Illustrated map #777 is awesome, and I highly recommend it for all your navigating needs for this ride. This trail will be great for guiding you down the trail, but will also be vital for navigating the back roads as you attempt to reach the lower and upper trailheads. The directions above should help you out with that too, but I still highly recommend buying this map. Jim Parham's Off the Beaten Track also contains the Windy Gap Trail, and it would be a good addition to your pack if you don't already own it. I like the videos. Just need a better choice in music.